Langkawi International Maritime and Aerospace Exhibition (LIMA) is a maritime and aerospace exhibition that takes place once every two years in the island of Langkawi , Malaysia. 2015 marks another great year of local and international attendance. With Malaysia replacing their ageing fleet of MIG-29, LIMA 2015 stars with Dassault’s contingent showing off their latest Rafale 4th gen + Multirole combat aircraft. Malaysia have put a strong interest on the Rafale as one of their main contender for the MIG-29 replacement. We have seen Rafale, Sukhoi SU-35, Eurofighter Typhoon and Boeing F/A-18 F competing for this slot back in LIMA 2013. But looking Rafale’s only presence and lack of others we can clearly see who is getting the contract. Airwingspotter made to this show and was spotting in various locations in the island and for Aviation spotting, there are many good locations to spot for aircraft in this airport. I will have a spotting guide for this airport in the near future. As we can tell from the aircraft list, multiple international aerobatic teams including the PLAAF first appearance on the International Aviation arena showing off their new J-10A Fighter Aircraft. Singapore showed up with the Black Knights spotting the F-16C, AL FURSAN AEROBATIC TEAM in their MB-339C and Indonesia Air force showed up with their Jupiter Aerobatic team spotting 6 Korean made KAI KT-1s. Unfortunately, in LIMA 2015, 2 of the KT-1 clipped their tail and got into a non fatal accident. 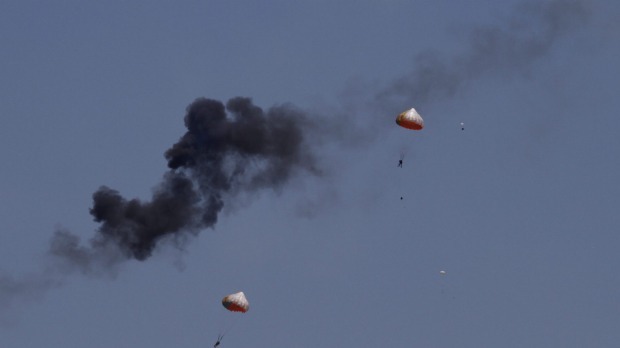 All 4 pilots ejected and survived. Royal Malaysian Air Force and Maritime Enforcement Agency, Army have a very strong contingent including their latest SU-30MKM, FA/18D, Hawk 108/208 , MB-339 aircrafts. These combination makes it very different from many air forces that spots only Western style combat aircrafts or Eastern bloc. We get the best of both worlds and variety makes us Aviation Enthusiasts drools. They even made an impressive multi platform flyby of SU30MKM, Hawk, F18D and MB-339. Furthermore, there is a good selections of military rotary wing on presence. we see the Super Lynx, Super Puma, Augusta A109, SH-60B MI-17 and Dauphin on both Static and Aerial displays.